The Bobcat TR50210 EVO telescopic handler features a robust, fully integrated boom head that adds extra strength for handling heavier loads. Designed for a long, productive life, the strong boom structure incorporates protection for vital parts such as the lift cylinder – enhancing the machine’s durability and reducing the risk of damage and downtime. 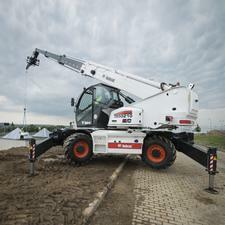 Faithfully following Bobcat tradition, the 21 m EVO offers advanced electronic solutions that enable the operator to handle heavy loads at significant heights safely and comfortably. Smooth and precise movements boost operator confidence, with a corresponding increase in efficiency.